Kris Thoemke has lived in Florida most of his life. He began fishing and enjoying the outdoors in the sunshine state in the late 1950s. He has a Ph.D. from the University of South Florida in marine biology. Prior to pursuing a career as a full-time outdoor and environmental communicator five years ago, Kris was the manager of the Rookery Bay National Estuarine Research Reserve near Marco Island. Wanting to share his knowledge about Florida's natural resources with a broad audience, Kris embarked on a mission to inform people about Florida's outdoors. It began as the host of Florida Outdoors on WNOG radio in Naples. The talk radio show, now in its ninth year, is a popular program is now also on WINK radio in Fort Myers. In 1990 he became the host and, a year later, the co-producer of Exploring Florida, a popular television series on PBS. He has also worked as the environmental and outdoor editor for the Fort Myers-Naples ABC television affiliate. As a writer, Kris has credits in several newspapers including numerous stories in the Naples Daily News and Marco Island Eagle. His magazine articles and photographs have appeared in Florida Sportsman, Gulf Coast Angler, Florida Wildlife, Florida Game and Fish and other publications. 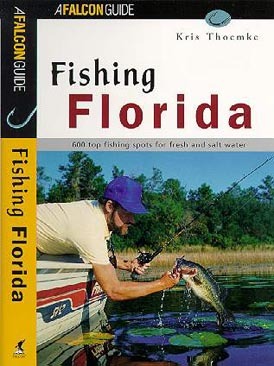 His book, Fishing Florida, is the most complete guidebook to fresh and saltwater angling in the state. A popular speaker, he is in demand as a speaker at conventions and as a naturalist guide in south Florida. He is an active member of the Outdoor Writers Association and has won numerous awards, including the Outdoor Communicator of the Year from the Florida Wildlife Federation.